Impressed with everyone’s work ethic. And Drew seems to have caught FIRE. I really enjoy today’s warmup (not going to reveal it so the pm’ers have something to think about all day). It’s challenging mentally and physically. You just have to fight through it. FWIW – despite a questionable ankle, I am registered for the rodeo 10k run if anyone wants to join me. Yee Haw Brad. Sorry we won’t be able to join you at the rodeo run, Daniel’s b-day is that day. Christina, good to work out with you on the front squats. I keep trying to catch up with you and Casey. Julie, appreciate you cheering me on while I was on the rower finishing FGB. Thats one of the best things about this gym everyone encouraging each other. Lynn, great finish. General shout out to the guys. Good WOD; intense! Not nearly as NASTY as the real FGB. Way to go Cassie on those last 9 Push-Presses and the 9-Cal row; you were ‘diggin-deep and it really showed, VERY impressive!!! Well that was… dare I say…fun. I too sub’d Back Squat because of the hand. The hand is better but this is my version of babying it. Dac said it was a sprain so i’ll keep goin as far as the pain threshold will let me. Everyday seems better and until that pattern changes I’ll keep drivin’ forward. I let myself think too much on box jumps. Lost too much time there because of a lack of intestinal fortitude. 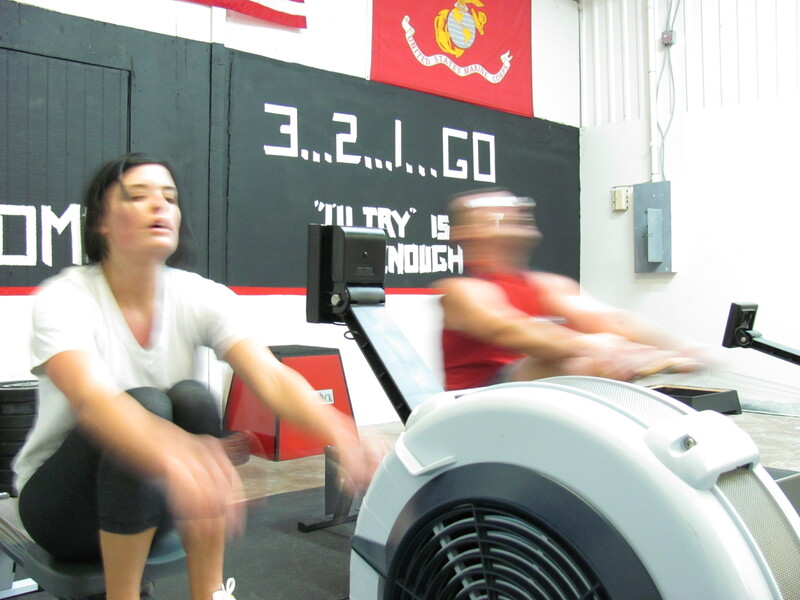 Lost a few seconds at the rower bc I tried to “drift” across the line on the 21 cal round. The Silverback Nation is starting to make me regret owning a two story home. I’ve made approximately 1 million ascent/descents this am and I officially hate box jumps. Did I mention I’m carrying stuff up and down as well? Putting things into the attic (read semi squat/duck walk!) etc. Ok whinning (sp) complete. must get back to “honey-do’s”. Thanks for listening to my whine-a-thon.